ITS experts provide multiple solutions and consulting services for all your business needs. Kforce is a staffing services and solutions firm, enabling customers to achieve their business goals through our innovative approach to managing immigration solutions and services. Through compliant accessibility to onshore international talent, we empower companies to complete initiatives successfully. Our staffing services provide quality professionals across all industries to accomplish your goals and initiatives. 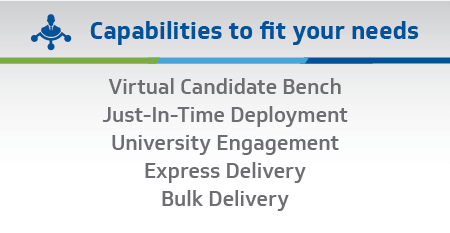 Empowered by our customized virtual bench, we drive results in highly scalable resource engagement to service customers’ timely needs. Seventy percent of our 5000+ international candidates hold a master’s degree. Gain access to our extensive talent pool today. We offer an in-depth assessment of our customers’ current international resources and the associated immigration risk. With a 97% visa approval rating compared to an industry average below 70%, Kforce immigration subject matter experts have a wealth of knowledge to offer consultative guidance and mitigate risk. The resource risk assessment can be conducted at all levels ranging from individual to enterprise. Kforce International Talent Solutions (ITS) has developed several methodologies to maximize the utilization of international talent, including managed teams, centralized vendor delivery and more. Through strict adherence with USCIS requirements and participation in government programs such as e-Verify, we streamline the immigration process for our customers with confidence. Leverage ITS for innovative solutions and guidance in your pursuit to develop an effective and compliant immigration strategy. As a firm ranked in the top 1% for visa sponsorship, we have successfully sponsored more than 15,000 visas since 2000. 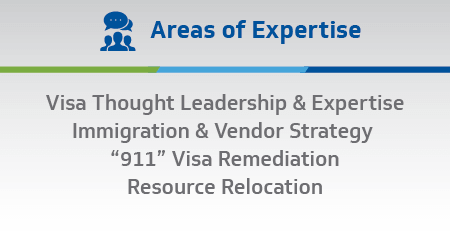 Kforce is an industry thought leader ready to support your complex immigration needs. Need to learn more about our International Talent Solutions? Send us a message and we'll get in touch with you.